Our fundamental objective is to provide our customers with reliable, performance critical data in a timely manner. PropTester is strategically located near Houston, Texas to better serve our customers in the oil and gas industry. Our test results enable customers to qualify materials prior to pumping and identify any deficiencies which could impact overall well deliverability. Through the use of our highly advanced technical lab and on-site validation, PropTester professionally and scientifically assures customers that quality materials including cement, fluid and proppant are being used every time in an efficient manner. 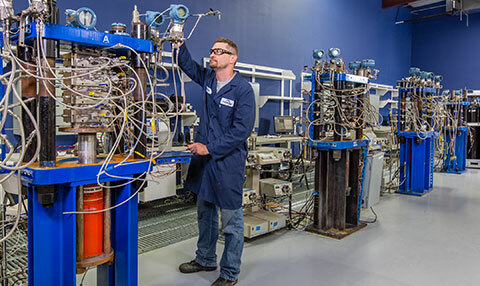 Our Best-in-Class employees are highly trained in the lab to guarantee accurate API and ISO procedures are implemented. Customers and potential customers are invited to tour the facility, meet our technicians and identify precise needs. Expert field technicians travel to the well-site, both onshore and offshore, to oversee operations. PropTester is proud to partner with proppant providers, service companies and operators from around the globe to meet their specified goals.